Announcement For Custom orders outside Europe, last day of ordering for delivery before Christmas is the 17th of November. For custom orders within Europe last day of ordering to get the delivery before Christmas is the 27th of November. A sweater is something you own for a long time! If you would like to own a custom made sweater, knitted after your own measurements, you have come to the right place. I offer you free shipping worldwide, and a turnaround time of about 3 weeks plus shipping. Measure up one of your favourite sweaters, or use your own measurements, and send them to me, and I will make you a custom listing. For Custom orders outside Europe, last day of ordering for delivery before Christmas is the 17th of November. For custom orders within Europe last day of ordering to get the delivery before Christmas is the 27th of November. Stjørnudust bodysuit for baby girl from Faroeknit. Hand knit from Faroese Wool. I've just received the sweater. I love the bright color and the design. I'd like to order another combination of the color again from this shop. Absolutely gorgeous little sweater with a nice letter from the knitter. My granddaughter will look wonderful in it! Thank you so much! Looking for a gift for him? Men’s sweaters are now available, finally! Measure up his favourite sweater, and I can knit a perfect sweater for your significant other. My flagship sweater, Bohéme, which I sell in all sizes, for the whole family. Over 70.000 free range sheep live in the Faroe Islands, but only 50.000 people. Faroese sheep wool is 7/8 merino. Bohéme Sweater, my very first sweater design, inspired by an old Faroese stitch pattern with Icelandic yoke. Warm greetings from the "Sheep Islands"
Faroeknit is all about custom made knitwear and knitting patterns, designed for adventures in the wilderness! I’m Randi, the founder of Faroeknit. I am from the Faroe Islands in the Northern Scandinavia. I live together with my husband and 3 daughters in Vágur, located on the southernmost island of Suðuroy. It all started in 2016. I had been home for about two years, with my youngest daughter, because of her very early debut of Diabetes Type 1. I had no job and a low income. I remember my grandma always said, use your talents, do not let them go to waste. While staying home, I reflected about my life and this: Is there something I am really good at? I have always been a creative soul, and I love to draw (even my math books were full of colours). And I love to knit. If I could combine my love of drawing and knitting, my life would be perfect! And suddenly it just made sense: Of course, knitwear designer is what I will become! My first sweater was the Bohéme sweater from 2017, and since then, I have not looked back. I live and breathe knitting and designing. I learned the art of knitting from my mom and grandma, and I have also read lots of knitting books since then. Knitting is something that’s been practised for many generations on the Faroe Islands. We have a very strong knitting tradition. I especially love the Faroese knitting patterns, and most of my designs are based upon those, but with my own twist. This is why, you will find most of my designs in the traditional two colour fair isle patterns. 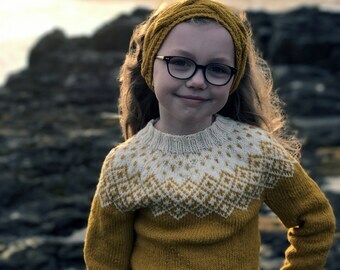 My knitting patterns are in English and Danish language, and free support is included. 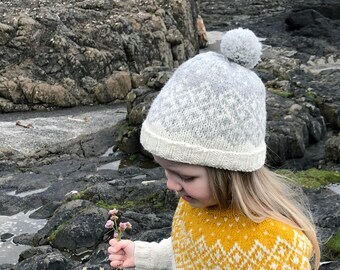 Besides the knitting and drawing thing, I love to read (I have a BSc in Library- and Information Science) and I love to spend time outdoors in our quirky, beautiful, rustic and windswept islands. A sweater is something you usually own for years. A Faroeknit sweater is the perfect choice for wool and knitwear lovers, who are passionate about nature and wilderness. I have an A-team of skillful knitters, who are committed to handmade perfection. My carefully selected team of knitters would love to knit you a warm, well fitted and fashionable sweater, customized for you! • Thick and very warm sweaters (Faroese wool): Rustic Aran yarn, itchy. • Thinner, but warm sweaters (Faroese wool): Softer yarn, not itchy. • Superwash sweater: Very soft, not itchy. • Alpaca / wool blend: Very soft, not itchy. Brave the wilderness in a fabulous hand knitted Faroeknit sweater! I am a mother of three wonderful girls. My youngest daughter has Diabetes Type 1. While staying at home taking care of her, I got the idéa to start Faroeknit. I knit, design and and take care of the everyday business of Faroeknit. 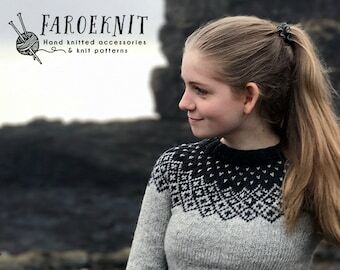 Faroeknit has a group of carefully selected Faroese knitters, who all have at least 10+ years of experience knitting. You can be sure to get the best of the best, when ordering from us.